Nedcargo and our customers make important decisions every day which are based on the data provided by the Trimble solution. Nedcargo dispatches 200 vehicles daily to supply the retail and catering sector with food and beverages, such as beer, wine and spirits. On an annual basis, about 1.4 million pallets and roll containers find their way towards more than 6,000 addresses in the Netherlands and Belgium. The products are distributed from six warehouses located in Waddinxveen, Haaften, Zoetermeer, Soesterberg and Nederasselt, where there are warehouses with products from well-known food and beverage producers. Data reliability plays a crucial role in Nedcargo’s operation. All trucks, from LHVs to box trucks, are equipped with Truck4U and FleetXPS. Together, these solutions from Trimble provide all the functionality which one can expect of an innovative on-board computer. 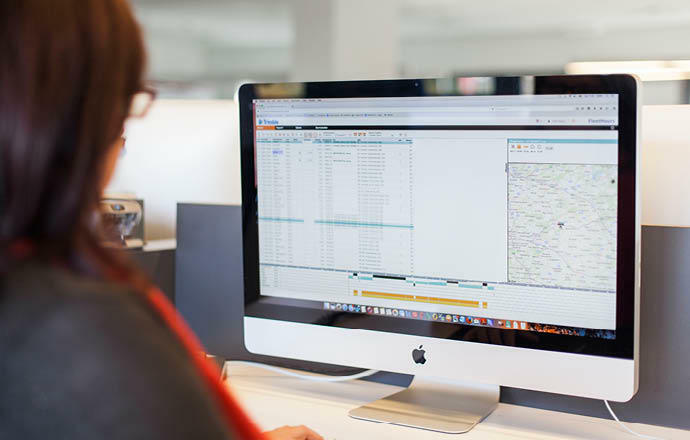 “Nedcargo and our customers make important decisions every day which are based on the data provided by these solutions. Truck4U and FleetXPS provide us with real-time insight into our fleet and real-time feedback when shipments are delivered,” says Mook. Truck4U is an on-board unit integrated as a black box into the 85 trucks owned by Nedcargo. This unit is connected with the tachograph and the CANbus of the vehicles and supplies the logistics service provider with remote download of tachograph and engine management data, and also with real-time insight into driving and rest times, driving behaviour and fuel consumption. FleetXPS is a mobile unit used by drivers to execute the planned routes and register their working hours. Drivers also use the mobile unit to scan the delivered pallets and roll containers or take photographs to document any damage due to transport. Of the 85 trucks, 70 are equipped with the FleetXPS hardware from Trimble. The 15 other vehicles use the FleetXPS App which runs on any device with an Android platform. The regular charters we call on every day also use the FleetXPS app. This means they can bring their own device and don’t have to invest in our hardware, while we still receive accurate trip data and are able to monitor trip times. The investment in the Trimble solutions came after dissatisfaction with the previous non-Trimble on-board computer solution. Trimble currently offers the best solution to meet our needs. 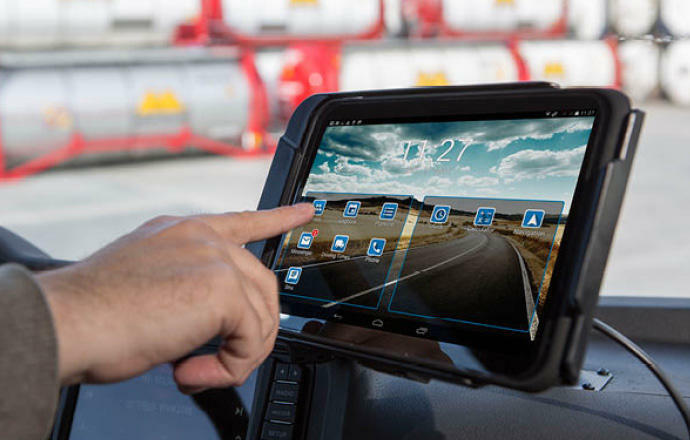 Trimble’s technology combines all the features of a mobile application and the data reliability of an on-board computer. “We looked for a new telematics solution with proven technology to improve our track and trace functionality and to track the position of our trucks in real-time. Trimble currently offers the best solution to meet our needs. Trimble’s technology combines all the features of a mobile application and the data reliability of an on-board computer. In addition, the Trimble solutions integrate with our LogicWay payroll software that we use,” explains Mook. It took only three weeks to install Truck4u and FleetXPS in the 85 trucks of Nedcargo. “The implementation speed illustrates that Trimble has the right technical expertise and that they paid attention to our processes,” says Mook. With Trimble’s solutions, the drivers are happy with the user-friendly, intuitive design of FleetXPS. The photographs they take of damaged shipments or material are automatically linked to the correct file and shared with the fleet managers. If the drivers scan the pallets or roll containers at delivery, customers can be immediately informed. In the back-office, planners have more control over the operation, and the atmosphere is calmer. Nedcargo provides storage and distribution for food and beverage producers throughout the Benelux. The logistics service provider has six warehouses at five locations for this, from where 1.4 million pallets and roll containers are delivered annually to retail and catering companies. Nedcargo currently employs 400 people, spread over 12 operating companies.